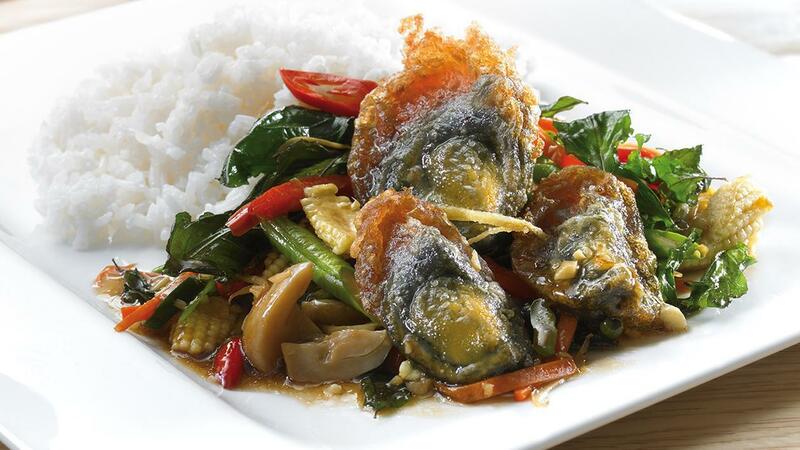 Present Thai tradition in a distinctive way by adding an appealing aroma, and create value to your dishes. Mix peeled preserved egg with Knorr Batter mix, fry until done then put aside. Heated oil pan, add minced garlic and bird's eye chilli. Season with Knorr Oyster Flavoured Sauce, Knorr Seasoning Sauces, Knorr All-In-One Rostip Pork Seasoning Powder, black soy, sugar and stock. Fry together and adjust taste as you like. Add minced fingerroot, pieces lentils, bamboo line, diagonally cut corn, pepper, diagonally cut green chilli, diagonally cut red chilli and basil. Put on serving plate and decorate with fried basil and correspondents.